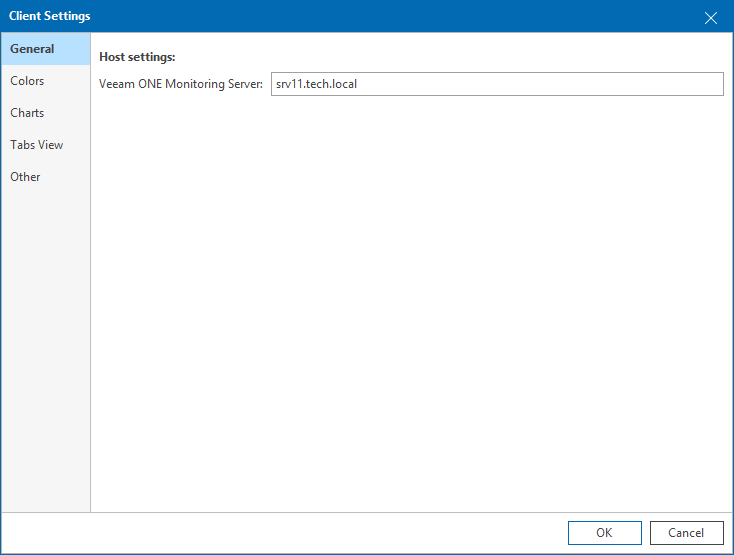 If Veeam ONE Monitor Client is installed separately from the Veeam ONE Server component, make sure that Veeam ONE Monitor Client can communicate with the Veeam ONE Server part. On the machine where you installed Veeam ONE Monitor Client, start the Veeam ONE Monitor console. If during installation you did not specify the name of a machine where Veeam ONE Server runs, you will be prompted to provide the server name. If, for some reasons, you cannot see a window prompting for the Veeam ONE Server name, in Veeam ONE Monitor menu select Options > Client Settings > General, and specify the name of a machine hosting Veeam ONE Server.